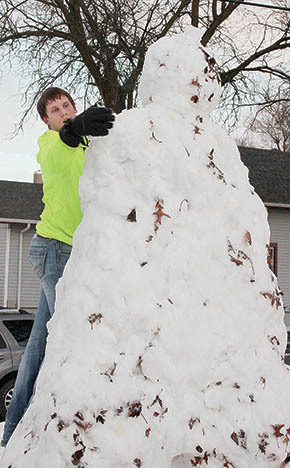 Steven Ruzek, an Albion resident since October, 2014, took on a major project last Friday evening, Feb. 6, building a 12-foot snowman in his yard on 10th Street. Conditions were ideal for construction, but the snowman didn’t last long. With high temperatures in the 50s and 60s on Saturday and Sunday, the structure had been reduced to just three small piles of snow by Monday afternoon. Area residents saw wide temperature swings after the snow storm last Wednesday, with a low of -7 on Thursday, Feb. 5, and a high of 66 degrees on Sunday, Feb. 8.